Heartening news about music in our messed up age is as rare as a smile in a third world prison. When a too seldom seen sonic lift to the lives of the groovy appears, it's worth taking stock, looking back and asking like the Main Man himself: Where are we now?The genius cubed born David Robert Jones in Brixton on the sacred day of 8th January 1947 is now of course David Bowie.He needs less introduction than the sun, moon and stars.Our own Funky Frenchman recalled a wise assumption from a girl he knew as a child: "David Bowie could not possibly have smelly feet." Indeed. He also is one of the rare Titans from the Saturnalian Sixties to never really let the side down. You've never seen him gurn botox dead for the rich accompanied by a pop slop strumpet like Xtina, or soaking the fans on yet another Greatest Hits Again Arena Tour.We've trailed his comeback and discussed the media mong lazy labeling and inevitably dashed, cruel expectations associated with the vile term before, but the last week has moved the story into a better dimension.Across the music markets, Bowiemania has emerged like a sleeping, unseen stardust and glass spider powered comet to blow up notions of what's popular and blow away all the cobwebs associated with "heritage" acts. Tom reports that Rat "can't keep a Bowie LP in the shop these days." Quite the endorsement from the funky public.The news could have been very bad. A big rumour after another silent period of many was that this former 60 a day deity had cancer and was in the Departure Lounge. Instead of this dark dispatch, we got a credible single on his birthday and a new album. Birthdays matter to Bowie, as we saw in 1997 when Mary Anne Hobbs brought him to tears via a taped message from his hero and fellow iconoclast, Scott Walker, whose own birthday really was on the Next Day.The Next Day LP emerged as an unexpected present to us all, and debuted right where it belongs at Number One - towering above all the Bumford and Buns, Adele Faux Soul Hells, and other worthless novelties. This is first of all a testament to the power of the Dad Rock Dollar to move musical money mountains, but secondly (and betterly) to the fact pop audiences are less dumb and unresponsive to genius than one might have thought.Let's look back, way way back to a time many of the Baby Boomer Bonus leeches think was uniformly great but in fact was a bit wack - the late 60s.As Lester Bangs revealed in one of his more worthwhile moments, rock and pop was infected with a foul kaftan cough - a highly contagious virus of uncool robbing audiences of authenticity.The first generation of 60s revolutionaries were steeped in strong sounds - the jukebox sweat and menace of REAL Black Rock, Soul, R&B and Doo Wop. With a smattering of Post Bop jazz experimental excursions to the edge of what is possible beyond verse/course/verse 4/4 and a world of music waking up in the former colonial chaos of the rest of the damned world. This is a rich palette, and demands the most from a performer to stay close to the groove, keep it real and only steal the best of the genre melting pot.Then the bad side of greatness kicked in.Lester spotted that something as musically ambitious and technically excellent as The Who, The Yardbirds and Cream could only get tangled up in a fog of pop pretense and solo starfucking - set apart from audiences, dance floors, and the real heart and soul of rock. A process of dairy product fossilisation as inevitable as gravity itself.There is something to this - if your influences are closer to the jukebox on the dark side of town, you've got room to groove and grow. If your reference point is untouchable supermusicians at their peak discovering Indian sham shamen or touring arenas worshipped like Guitar Godcocks, surrounded by coked up riders and yes men, your roots are too shallow to yield more than a shadow of a shadow of shadows. A lot of promising talents were tangled up, strangled up and lost in this gilded fog of mediocrity.Bowie emerged in some pretty barren, raked over and overgrown sonic soil. He and his contemporaries had four creative roads to choose from:1. Get cape, wear cape, fly and die with the proggy tide and show off with endless noodling and jamming knives in a Hammond for extra "art" - like ELP.2. Go with the flow to a large degree, try to weave the same old magic on a bigger stadium stage in superannuated starry sojourns from tax exile - like the post Let it Bleed Rolling Stones.3. Lose all interest in pretence, revolution and possibility to pop it up in costume for the kids with three minute bubblegum bops and bustle - like Bolan at his best and Slade at their worst.4. Plug in to the avant-garde and the better older real grease and switchblade rock tradition, in absolute opposition to hippie cash grabs and GSCE level cartoon leftism - like The Stooges, Roxy Music, The New York Dolls and The Velvet Underground.Bowie bashed out a Fifth Way: His own. Blending classic rock and pop instincts with a magpie mind for borrowed grooves and the self-defined constant evolution of Modernist artists. After a self titled folky misfire in 1967, Bowie anticipated the loss of progress and deadly reality of the exhausted 70s with Space Oddity. Major Tom went on a solo arc from plastic media heroism into a lonely, fiery and pointless death - burning up on re-entry to reality like so many utopian Post War pipe dreams.This was just the beginning of a decade plus run of total perfection.The stars aligned within him, and every new persona came fully born out of a brain not satisfied with the beige novelties of now. Ziggy Stardust was Vince Taylor spat back out of a Soho tailor's window with a short short Best Before date stamped on his starry spider super power visage.After this Moonage Daydream woke us all up with his very own Rock and Roll Suicide, Bowie moved on faster than audiences or critics could cope with. Aladdin went insane in his own space race, Pin Ups reworked real roots rock classics for a new day, Diamond Dogs and Young Americans soaked up Philly Soul and a powder room break baroque blast came on strong with Station to Station. Meanwhile, he appeared in The Man Who Fell to Earth, the best film you've never seen, as a melancholy man from light years beyond all.As a belated Punk revolt cleared out the pop u-bend to some degree and disco danced in to wish away the stagflated stink of reality, a Berlin brainstorm with added Eno enchantment broke like a storm across the soundscape. Low remains one of the most perfect pieces of popular art ever created. Bowie is the great self re-inventor, but has always flown above mere novelty and tides of trend. "Breaking Glass" remains an elegant uppercut to the gobbing safety pin money pitshits of Punk, which all too often were based far more in thankless attitude than artistry.The Great Great period ended with Scary Monsters, a criminally underrated record that anticipated and overcame all 80s musical trends before they even had been imagined.Our thanks could never have been adequate, but in the mixed up decades to follow Bowie seemed to go off the boil.Let's Dance had some mountainous musical moments, but other than a somewhat soft single about Loving the Alien, Tonight was not so bright. Absolute Beginners was dangerously dire. Labyrinth was lovely, a Freudian journey into an adult awakening with much fun in a fright wig, but only served to highlight the lowlights. Overexposure and too many retreads encouraged the courage to take a sideman's seat in a new hard rock outfit, Tin Machine - which became more of a shorthand punchline for supergroup wrong turns than it deserved.And so then a 90s and noughties semi-recovery with irregular semi-forgivable albums until a decade of silence, looming cancer rumour and mystery until now.All this talk of a "comeback" makes me wonder if David never actually left?If we, or at least the pop public, industry and media, sent him away until he could return, colder older and still all too wise? For these days music markets are shoved into genre ghettoes by nearly all but the truly groovy. Records like Low and Station to Station would never get beyond the back pages of Wire today - forget about touching the NME and mainstream media. Where would Scary Monsters get filed on the iTunes store? Post-Rock? The only place he could go was the pensioner's death waiting room called "Heritage" or "Classic". Such a place rejects innovation or any deviation from Greatest Hits tours or cynical unfabcollabs with the nothings of Now.All these self imposed sonic safety barriers retarded our appreciation of Bowie and his possibilities as an artist. The tragedy is best understood via of of his under-noticed deep cameos on film. 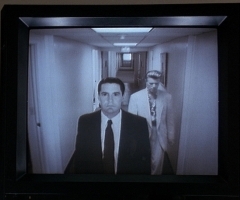 In Fire Walk With Me, David Lynch's passionate prequel to Twin Peaks, Bowie plays the mysteriously lost FBI Agent Phillip Jeffries - a man caught in some other quantum multiverse beyond the Black Lodge - too fast to be visible except briefly on disputed CCTV:"He's gone! He's gone! Albert, call the front desk! ""I've got the front desk now. He was never here." Indeed.But any music lover worth a fig needs to get down here this Saturday for sure. Click here for the photo evidence. Take a good gander because got new collections in of such desirability, people are offering all sorts of favours to be able to get a preview. But the game is the game, and the rules are the same for all. So be early and prepare for yet another new in full of true gems!We have plenty of classic electronic music from the noughties : expanding, Skam, Warp, Plante mu, Rephlex, Mo Wax, Peacefrog, De Focus, Earth and Good Looking,.. it's a long list of respected labels, all in stupendous condition. like walking into Smallfish records again, for one Saturday.We have some fine soul and funk 12inches and LPs and also Jazz and Afro Funk. BLO, Betty Davis, Lou Donaldson, The Dells, Marlena Shaw..Classic Rock&Folk and Alternative a gogo yet again: the usual suspects : Cohen, Dylan, Joni Mitchell, Hendrix, Beatles, Neil young, Cocteau twins, Elastica, Pop group, Slits... it's a LONG LIST.The all thing will be peppered with hip Hop, reggae/dub and plenty of breaks and beats and battle records.Don't miss...!